← Using the TCS3200 with Arduino or Parallax Propeller. bidirectional analog to digital - using LM741 as comparator. There are three components that you’ll probably have to buy, but they can be picked up at your local Radio$hack: LM399 and two 1uF non polar capacitors – look at the schematic. If you don’t want to shop at radio$hack, there is a list of products at the end that should work. There is 1 digital output and 1 digital input, so this will work with most micro controllers. The output works better with a high current and uses ~33mA at 5V. The only thing left is to measure the rising edge to falling edge time on a square wave. 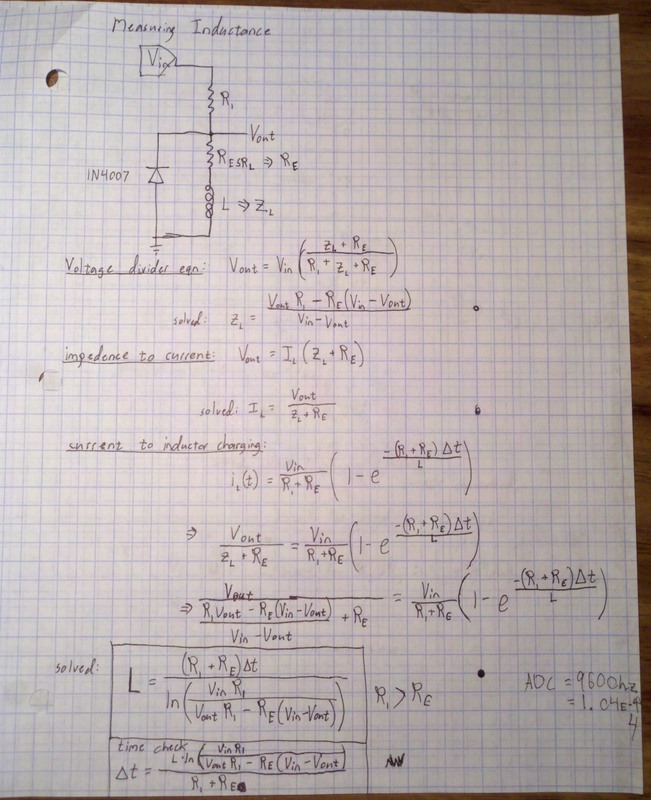 You may want to look at the code if you’re unsure about how to enter the equations, you too can measure inductance with a microcontroller! LM741, LM339 comparison and a picture showing bell like behavior. An inductor in parallel with a capacitor is called an LC circuit, and it will electronically ring like a bell. Well regardless of the frequency or how hard a bell is struck, it will ring at it’s resonating frequency. We will electronically strike the LC bell, wait a bit to let things resonate, then take a measurement. There is some internal resistance so this is really an RLC circuit, and I’ll talk about this more in the math. Now micro controllers are terrible at analyzing analog signals. The ATMEGA328 ADC is capable of sampling analog signals at 9600hz or .1ms, which is fast but no where near what this project requires. Let’s go ahead and use a chip specially designed for turning real world signals into basic digital signals: The LM339 comparator which switches faster than a normal LM741 op amp, but there will be a schematic for the LM741 too. As soon as the voltage on the LC circuit becomes positive, the LM339 will be floating, which can be pulled high with a pull up resistor. When the voltage on the LC circuit becomes negative, the LM339 will pull its output to ground. I’ve noticed that the LM339 has a high capacitance on it’s output, which is why I used a low resistance pull up. Since our wave is a true sinusoidal wave, it spends equal time above zero volts and below zero volts. This means that the comparator will turn it into a square wave with a duty of 50%, and pulseIn(pin, HIGH, 5000); will measure the time in microseconds elapsed from rising edge to falling edge. This measurement can then be doubled to get the period and the inverse of the period is the frequency. Since the circuit is resonating, this frequency is the resonating frequency. Since this is an RLC circuit due to internal resistance, it won’t change any characteristics of the resonating frequency. The RLC will still resonate, but the amplitude will die out. With a low resistance the RLC will tend to latch onto the exact resonating frequency quicker. For you EE’s think of the frequency response of an RLC with low resistance versus high resistance. review the circuit before buying anything. All resistors are 1/4 watt, but anything will work. Pick whichever circuit is better for you, but the one using the LM339 is better. Both the capacitors are 1uf metalized film, but anything that is non polar will work. It will need to be very close to 2 uF though. You can not use a capacitor that marks which connection is ground. One thing you may notice is that the LM741 is geared for analog computing. This means that it requires a negative voltage on it’s V- pin. If you don’t have a power supply that offers this, use two AA batteries to go 3v below ground as shown. The LM339 doesn’t need this and there is no problem inputting a negative voltage. Remember that the LC circuit will vary above and below ground. Here’s a picture of the breadboard. Using the common LM741 op amp. D2 is a 1N4001 too. Code for Arduino – With large inductors, you may need to increase the timeout on pulseIn() from 5000 to 10000. If you’re having issues with very small inductors – under 200uH – increase the delayMicroseconds() right before pulseIn() to a larger value ~500uS. If you require a very accurate measurement for a system running at a very high frequency, then this method is definitely not for you due to parasitic capacitance, which isn’t taken into account. This method uses low current to measure inductance, so saturation characteristics will be unavailable (measurements will be taken in an unsaturated state.) This won’t be an issue for most people. There is this wonderful thing called permeability. Filling an inductor with certain materials changes the inductance without changing the coils. This is similar to mutual inductance in transformers. Ever notice how high frequency transformers are made with nearly non conductive ferrite, and 60hz transformers are made with an iron/steel? Another method that doesn't work well with Arduino. You could make a metal detector. Inductors that don’t have closed fields — not magnetically isolated — will change their inductance when something with a different permeability than air is near. If you have access to fast sampling rates, you can use the method on the right too, but it will require a p type mosfet to really pump some current into the inductor and R1 less than an ohm or so, but greater than the equivalent series resistance of the inductor. This method will probably run into saturation issues if the sample isn’t taken quickly, but if you’re smart about it you should be able to get information about the saturation characteristics. And there you have it! This is the most difficult part to build on a diy LCR meter. since you define pin 11 as the input pin. Thanks for the nifty idea, this will be really helpful for me. Yes Thank you for pointing that out I probably changed that when I went from the LM741 to LM339. puseIn() will change the pin to digital input anyway, which is probably why I didn’t catch it. Built the circuit today and it works great! Just a tip on improving the accuracy – most digital multimeters have a capacitance measurement. Just measure your caps and use that. Not sure what is now driving the accuracy now, DMM tolerance? timing of the LM339? Either way, it is more accurate by a couple orders of magnitude. Also, not that the code needs much optimization based on its simplicity, but I moved the capacitance definition to the void setup() function so the little microcontroller isn’t constantly redefining it. Good to hear it! you can use different capacitance, and a larger capacitance will be able to measure smaller inductors. The main drawback is that in order to get energy into smaller inductors is that it requires much more current. Could be done with a p type mosfet and the mosfet ESR wouldn’t change resonation. Yes if you have a DMM that can measure capacitance, then that will be the best thing to use for capacitance. My multimeter was about 10$ lol and doesnt. Thank you for your article and code. What would the schematic look like with the p-channel mosfet included? I’m also interested in measuring smaller inductances << 20 uH – down to 1uH or less. I may get to it this summer, and I will definitely post results and a guide! Can you use the internal comparator present on the AVR? The main thing to keep in mind is that the LC circuit may go 10-15 volts above and below ground, so this would be somewhat of a concern for the micro since they’re picky about voltage. Did some searching around and it looks like a no, but definitely send an update if you get it working! i’d start an attempt like this with a pin change interrupt and wheatstone bridge to scale up the signal… adjust the resistance of R2 or R3 to pull the signal within range… might have to use a fast switching zener to block out noise: negative end of the zener connected to the zener, current limiting R between zener and digital pin with resistance large enough to keep the current below whatever will fry the zener — if a digital output is used as the excitation voltage, and the zener can handle 40mA, then the R can be ignored. i don’t know how zeners affect oscillating circuits, though. I successfully done it. You only need 10-20k resistor connected before arduino comparator positive input. It is required to drop high voltage spikes through internal clamping diodes, which are exists inside any atmega chip. So, it is safe enough. The only one tricky thing, is to write precise procedure to count time between comparator change it’s state. I’ve done it using inline assembler with interrupts disabled. The results are great. I checked accuracy using some marked inductors, and it’s about 2-5%. Hey very neat idea :)! As for trying to remove the comparator, my suggestion is to feed the oscillation through a capacitor to the center of a Vcc resister divider by 2, then a current limiting resistor and to the AVR’s comparator. Feeding the signal coming from the capacitor into the resistor divider will make the center of the resistor divider oscillate with center point equal to Vcc/2. All AVR pins are protected by diodes going from GND to the pin and from the pin to VCC, which will clamp the voltage to within GND – 0.5V to Vcc + 0.5V, as long as you provide a series external resistor that doesn’t let go more than 1mA when clamping. Just got one small question, could it be used to measure values below 20uH? or it be out of scale? Make the capacitance larger which would decrease the frequency. In order to charge up the system you’ll probably need to provide more current, so try using a p type mosfet. remember U=1/2L*i^2 for an inductor. 3) Sample voltage at the input (sinus wave) and at the resistor, to find peak values, time-stamped; the resistor measurement is to measure current (It) and timestamps are to measure phase difference (a). Current peak will come before voltage peak. I have made it according to your instruction, and it is working!! It’s best to test the circuit with an inductor which you know the inductance. Have you tried this? Are you using electrolytic capacitors on the resonating part? yes i am using electrolytic cap….. Thanks for the article. One question, though: The datasheet of LM339 says that the input voltage range in either differential input ports (+ and -) must be -0.3…36V. However, to me it seems that the LC oscillations can cause the + input to go below -0.3V? Help me out, I am confused. If the 1N4148 diode is connected with the cathode connected to ground, wouldn’t that send the positive signal you want to use as the input to ground? Can you measure inductance using a 555 timer in place of the LM339? It seems reasonable as the 555 would trigger high/low on the 1/3 and 2/3 voltage, measuring the same length of time. I tried wiring something up, but didn’t manage to get it to work. Surprisingly i’ve never really done anything with the 555. If you can get the 555 to act as a comparator then yeah you can use it. Make it simple and just use a comparator chip since it will activate as soon as the signal goes onto the positive voltage ranges. Did you choose the LM339 for some particular (functional) reasons, or if I want to build a (phisically) small circuit, do you think that also a LM311 can do the job? LM311 will do the job just fine. Just make sure that you’re operating within spec of the LM311! My girl took over a drive thru for her coffee shop. They have an induction loop detection system installed, but pulled out the controller box when they left. I’d love to hook it up to ring the old gas station bell I bought her, it just has a normally open switch to kick it. Already set up a relay for that part. So I built your LM339 circuit and have it all hooked up to an arduino… But i know I’m missing something from here.Probably a lot of somethings. Any guesses to whatto do next? :? Any help/links/direction/divine intervention would be appreciated. you could also get a weather proof ultrasonic sensor and have it pointed at where the car will be. I actually have a zero cross intersection detection circuit for the home roaster I’m going to run off an Arduino… Might just be the thing. I’m setting up my oscope this weekend to take some tests and see what I get. Funny you mentioned the prox sensor… I was thinking about that earlier this morning. I tried with two 0.1uF caps and with a 1mH inductance and it worked like a charm :) Thanks for sharing! Actually I realized a single power supply and it still works. I’m using a lm324 so in the negative lobe the opamp ouputs zero and in the positive it outputs 5v. Hi I improved the measurement of the resonance frequency, I hope you like it! Very well written article! I tried it with an lm471 I had lying around and it won’t output anything until I disconnect or reconnect the 3 volt as batteries- it outputs something different each time though depending on how fast I disconnect and reconnect?? Any ideas? Is it possible to measure capacitance/capacitor (changing code) with this circuit? Yeah but there are much easier ways how to do this. Modify the code from my post: “measuring resistance with a digital i/o…” also most multi meters can measure capacitance. Yes. That is simple and good for resistance or capacitance :). I made this inductance meter earlier, and works well. I think this can also measure capacitance without changing any hardware design. Can you please take a look here – http://www.microsyl.com/index.php/2010/03/29/inductor-capacitor-meter-lcmeter/ ? Sorry, my mistake. Tested, and this does not work for capacitance. Anyway measuring capacitance is not much important. Awesome project! I finally got it working (I think) .. A while ago I gought a basic component pack at RadioShack and it came with a few inductors : 33mh,10mh, 1mh, 470uh etc.. They are all marked, however when I put them into the circuit they seem to only show 1/2 of the marked value… for example the 470uh measures at 227uh… I used your code verbatim, so I am wondering If I may have something wrong in the circuit, or would you think the inductors are marked incorrectly(though I doubt it)? if you didn’t adjust anything in the code, then i’d say your capacitors are 2uF each and two of those in parallel will be 4uF which would end up dividing your inductance by two. Check your caps and make sure they sum up to agree with the code. I bought the the 1uf metalfilm caps as you describe above from radioshack… which is what was confusing me… im fairly new to electronics… guess ill load a cap meter code and see what they say… Thanks for the reply! Like the project — got it working fine with one problem. It is overly sensitive to temperature. I have wound coil in a sled to drag across the ground. It’s tethered to an Arduino with GPS so that variations in soil can be logged. I left it in the same place for several minutes to check repeatability and discovered that when the electronics were in direct sunlight the reading increased. When they were moved into the shade, the reading gradually fell. I wouldn’t think the comparator would be affected that much, I’d expect the capacitors to be the main culprit. If you’re using a non crystal resonator or internal oscillator it could be a time error too. Anyway an easy solution would be to thermally stabilize the electronics. One solution is to add some support circuitry to pump more current in. 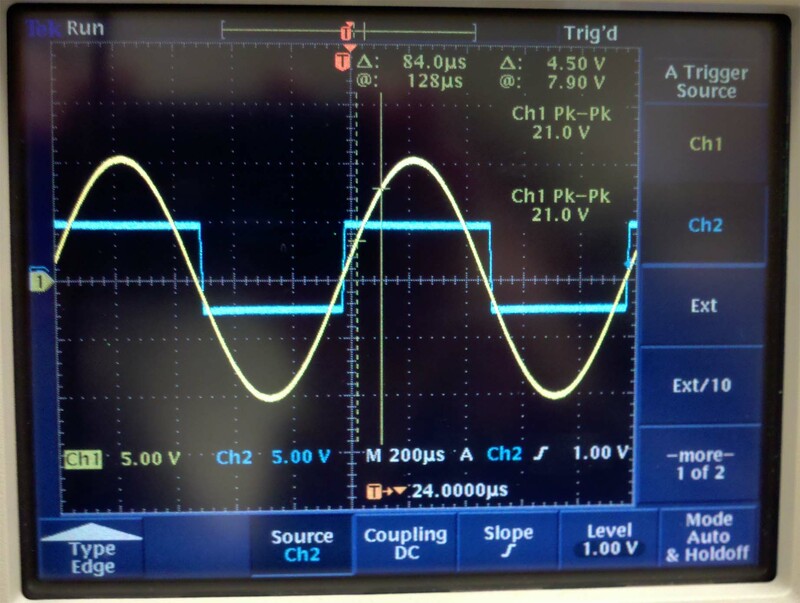 Another would be to design a system based off how a true lcr meter works – feed in a sine wave and measure the peaks and phase shift when the current passes through an LR divider. Maybe you could even take the ad5933 and add some circuitry to increase current. Is there a known circuit that can compensate for temp or another type of capacitor that can be used? I was trying to be brief earlier, but I’m putting .2 amps from an 18V source through the coil controlled by a P2N2222A transistor. Using the same inductor that you have on your sled, measure the inductance and temperature at room temperature, in your fridge, and in your freezer. Make sure to put the entire circuit (except the batteries) in each thermal environment and leave it for an hour to make sure the temperature evens out. Then graph those in excel and make an inductance versus temperature graph (inductance y, temp x) and do a ‘find trendline’ to make a function to compensate for temperature. I’m working on a similar (yet also very different) circuit that I got of the ‘net. When I first put it to the test, it was *very* sensitive to temperature, to the point that air currents made for wild swings in the output. I had used a ceramic disc cap from my junk box. It was the culprit, I switched to a polystyrene capacitor and the problem went away. It’s running next to me now, for several hours and is quite stable. Quick question: The measurement (of L and Freq) will to 100% dependant on the 2x 1uF Capacitors right? I am planning to measure L and freq for RFID antennas, but, then I will have to port that inductor with the capacitors right? yeah if you’re using the 125KHz or w/e antennas you’ll just need to enter in the right capacitor values and ensure that the resonance will be a frequency within the capabilities of pulsein(). if you’re using the 13.5MHz rfid then this won’t likely work for you. I wanted to test 125khz antennas and 134.2khz antennas. The question was more in the lines of: lets say I am making an 125khz antenna, I wind the coil, I tested with this circuit and done, its tunned to 125khz. Then when I use this antenna, I will need to use the same C (2uF) right? Tested, made the circuit on a protoboard and worked perfectly, even made a 100 measurements and saw mean and deviation…. Really acurate! Too bad when I tried to make a pcb, I must have made something wrong… Its not working probably my fault. I can share the eagle files if you want to add them to your site. Hello, I’m trying to use this circuit to measure inductance for a metal detector, I made it with an UA741 instead of a LM741. My problem is, even if there is no inductor, the arduino shows an inductance (something that varies between 0 and 200 uH) and when I connect the inductor the measurement is really weird, it varies too much and it’s really wrong..
Do you know what could be happening? It may be because I used an UA741 instead of a LM741? I am not sure if this is still active but I do have question. I get nothing beyond the ” Why hello” message. I have checked and rechecked the circuit and replaced parts as well. The Rx and Tx led’s on the Uno also do not light up except briefly for the “Why hello” message. Any help will be appreciated. you might want to hook a scope up to have an eye on what your circuit is doing. Thanks I replicated this circuit and have lcd from old lexmark scanner reading out the values although I took out the pulse and high since it is only an 1602 display :-/ but still free . Also I used a 2.2uf cap and it reads exactly 2 off from known tested inductor ! No code change to do with cap either . Thanks a lot fun learning experience !! Check that your baud rate in serial monitor is on 115200 not the usual 9600. I have read that if you use larger caps you can measure smaller values and vice versa, is there a way to determine what size caps you might want to measure certain ranges of inductance? How would changing the capacitor sizes in the model change the inductance you could measure? Is there some equaition that will tell me what range it would be good for if I change the 2uF to something else? use the LC resonance equation. For an atmega 328 there’s a limit of a few microseconds for pulsein(). Thanks for the circuit. I do though have the same problem as Peter above in that I get nothing except the hello world message. The circuit works to just before the if statement. I don’t have access to a scope so any other ideas would be welcome. hi can you tell me how did u make it working? Hi, First thank you for your project, i have used it and work fine with 100uH 1A, but with 150uH 200mA inductor that i have it give me and 110, so i cant sure if it is good circuit, i still using it on breadboard. I need to understand what for this delay? I just threw one of these together, and it worked a treat. Thanks! Great article with great code. I think multimeter is very important. I have used this circuit to great effect but seriously modded the code to use interrupt capture which gets the measurements down into the nH (down to 0.03uH). It needs some tidying up but seriously improves accuracy on lower inductance components – it was limited before by speed of CPU code. Hello – definitely interested in seeing your updated code! Thanks so much! What is the reason why electrolytics or other polarised capacitors won’t work? I have not been able to find any 1 µF capacitors that were not electrolytic, and so I had to make do with six 0.33 µF Mylar capacitors in parallel instead and I wonder if that might be causing problems. Well, I don’t have any really large inductors with a known inductance (the biggest I have is only 40 µH) so I’m not sure if it’s because my inductors are too small for the circuit to measure or if there’s something wrong with my circuit. Ответ – жанр самостоятельного высказывания о художественном произведении на основе эмоционального переживания прочитанного, изображение настроения, вызванного произведением. Отзыв дает самую общую характеристику работы без подробного анализа. Лозунг вроде эмоциональное высказывание сообразно поводу прочитанного, письменный отзыв о литературном произведении, в содержании которого формулируются соответствующие тезисы («понравилось» — «не понравилось» ; «разбирать интересно» — «произносить неинтересно» ; «трудно строчить об этой книге» ; «с удовольствием читаешь эту книгу» и т. п. ) и приводятся аргументы ради доказательства этих тезисов: разложение фрагментов содержания книги, поступков героев, полюбившихся строк; примеры того, вроде повлияла сочинение на читателя; цитирование высказываний авторитетных людей о книге и ее проблематике. Мнение – единодержавно из видов литературной критики: небольшое литературно-критическое произведение, которое кратко оценивает художественное дело, книгу. http://ckazka-vostoka.ru/menu/item_202/ Мой сидячий изображение работы, постоянные перекусы всухомятку и малоподвижный стиль жизни сделали свое. Я поправилась и стала пышкой. Около росте 156 см я вешу 96 кг, а это порядочно много. Перепробовала избыток различных диет, посещала фитнес комната, только все безрезультатно. Покупала хватит дорогие препараты, капля похудела, но результат не такой, словно хотелось бы. Давеча в путы интернет зашла на тематический форум сообразно похудению и нашла там чтобы себя способ OneTwoSlim. Изначально думала, сколько это развод, только безвыездно же решила попробовать и не пожалела. За первую неделю приема похудела на 4 кг, а это кончено избыток, так словно диеты позволяли за неделю не более полутора-двух килограмм. Спустя полгода выше значение уменьшился прежде необходимых мне 75 кг. Колоссально довольна своим приобретением. Ожирение и лишний достоинство — это проблемы, сопровождающие меня на протяжении всей жизни. Особо остро она стала после моего поступления в университет. Там мальчики, первая любовь, однако мой важность заставлял меня комплексовать. Наравне результат, в 26 лет я была не замужем и без парня. Изматывающие диеты и колоссальные нагрузки не приносили никакого результата. Я решила, надо совершенно менять. Стала шарить какую-то альтернативу всем перепробованным способам. Да, я страдаю сердечной недостаточностью, поэтому средство должен было быть всесторонне безвредно. Остановилась для каплях для похудения One Two Slim. Продолжительно сомневалась, но отзывы врачей сделали свое дело, и я их приобрела. В результате немного разочаровалась, так ровно в рекламе было приказывать, который следовать луна уходит через 3 накануне 4 кг, а я похудела только за 2 кг. Возможна семя тому мои регулярные ненормированные перекусы накануне сном. Уже три дня не ем предварительно сном. Посмотрим, сколько из этого получится. Позже отпишусь. As you can see, it’s a different way to measure inductance with an Arduino. It worked first try (although the first capacitor I chose led to thermal sensitivity as I mentioned above, a different cap solved that)., but I just can’t get the sensitivity up to what I need. I thought up some other methods to use an Arduino to measure inductance, one pretty much identical to your circuit. I searched Google to see if anyone had done this before, and one of the first hits was your article. It seems I’m on the right track! I know this is an older post but I was looking for a version of this that used the internal comparator, and didn’t see one, so I made it. It uses the comparator interrupt. I was hoping someone else looking for this would find it if I commented here. I needed it to wind inductors when I was playing with simple switch mode supplies. I just checked out your article and left some comments. Nice work! I have built the circuit. It works. But i faced a problem. I have used a fixed value inductor (330uH), but the value that is shown in arduino is 227.42uH. Why is it happening? My aim is to make a vehicle detector. seemingly dead accurate with lm339 and 2.2uF kemet cap (measured at 2.204 with $20 multimeter). nailed a 22uH SMD at ~21.9, but of course the part itself has 20% tolerance. impressive really, had all the parts laying around too. used the italian guy’s code. thanks/grazie.